Symbols are in our world as part of Divine Consciousness. As people become more attuned to the energy of their Higher Self, they become more aware of symbols as a form of communication. An additional offering we developed with separate trademarks, copyrights, and material from our normal curriculum is a class where certain blueprints and guides from the Universe are learned and experienced. 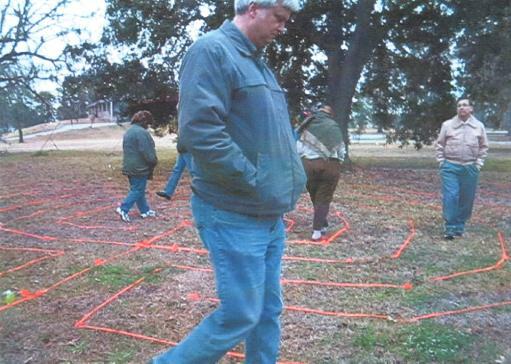 This class is called the Tree Drawing Interpretation Class. It is so much more than Tree Drawing interpretation, however. In that class the participants literally get in touch with the Higher Self through divinely experiencing one of the major symbols provided to assist mankind. Gifts of thought and a physical gift are literally received through this Divine Symbol in the class. One of our students was a law enforcement Sergeant. He is a very nice man with major talents in forensic and traditional hypnosis. 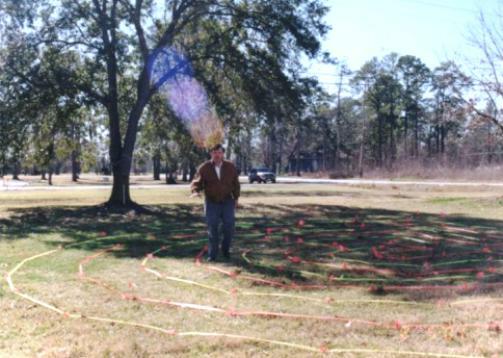 He is approximately six feet four inches tall and did not really want to participate in experiencing this symbol because of the golfers on the golf course where we lived and taught this class in Kingwood, Texas. He felt they would look at us with derisive thoughts. He is a cooperative person and decided to go ahead and just experience being out in nature. Skeptical was his consciousness as he participated. Our teachings are supported by the Divine and we often have validation to spur us on. The greatest validation I could ever experience was what happened with this student. I knew he was a nice skeptic and an honest, nice, skeptic. He joined in the process of experiencing this symbol of connecting to your Higher Self by following instructions. The first instruction was to focus on a question which had literally been bothering each person participating. They were then told to follow the PATH and notice thoughts, experiences, etc. which happened during the process of participation. After the participation, this was what he told the group. Also, I would like to add: he was never a big talker in class. For him to speak up showed it was a major experience for him. This student told that he thought of a question which had been bothering him. It was a worry about his teenage daughter and if he was providing the proper fatherly role model for her. He then followed the PATH and noticed the golfers at hole number 1 just left his consciousness. He felt at peace in nature. About midway along his PATH he heard in his mind these thoughts: “All is well”, “She will be fine”. He then started a process of wondering did he will it to come to his mind. He did notice a peace and contentment come over his being and continued his PATH. We had gifts waiting at a tree. Each gift is wrapped and can’t be seen. Some are more expensive than others and the wrapping may not show the value of the gift. When he picked his gift which had a message inside this is what he got: a figurine representing relationship and the written message was: “Your parental issues are resolved.” Since he had never talked about his personal life at all other than about being a law enforcement agent, no one in the class knew about his parental issues. When the writing was put on the paper and the item bought, he certainly was not in mind. However, the Divine Symbol was was very much there for him. This picture above shows the divine symbol used for powerful, healing meditation. 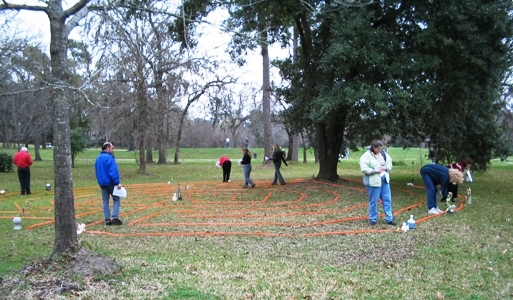 As you may know it is the labyrinth and it is experienced in this highly evolved class. This particular picture was taken the weekend before the picture was taken of the fallen tree mentioned later in this write-up. Notice the circular colors above the head. The picture above is of the law enforcement officer mentioned earlier. This was actually the second one of these classes he took. It was not his first experience of not really wanting to walk the labyrinth and getting the gift he got. This 3rd labyrinth picture above shows the view of the golf course from the walking site. Also, in this class, you get in touch with what Ted Andrews calls the symbol representation of either yourself or what is happening to you at the time of the class. This is your Power Animal. We have had some major occurrences with this. Everything we do in this class is done in a way that a person participating cannot say that it was arranged for them to get a particular message. A meditation is done where a person relaxes, goes to a level of connection with their Higher Self, and literally with their eyes closed draws an envelop. After the meditation, they open the envelope to a picture. They have chosen their Power Animal. One man who went on to create a hypnosis practice with a yearly gross of approximately $400,000 working with large weight loss groups in his business had a badger as what he pulled. The attributes he exhibited in class were exactly that of a badger. Before the year was out, he smoothed those characteristics to where he could bring in large groups and help them lose weight. A person who was exhausted and on the last leg of extreme burnout drew the Otter. Drawing this helped break denial about the tendencies towards denying self and needing fun to save them. Another person who was considering working with professionals to assist them continue to help others had one symbol drawn in the envelope but told that he also had an image come to his mind. The symbol in his envelope was a Black Jaguar which represented getting personal vitality back after a major occurrence. (This was his experience after just having decided to get back into life after a major illness almost killed him). The other symbol which came to his mind was one we had to look up. It was a jackass. Needless to say, I was worried about what we were going to find. Total amazement was what I felt when we found it. The look on his face validated that he had received an answer to what he had been pondering. The jackass represents the healer of healers. This validated that he needed to specialize on helping helping professionals stay in the ballgame of helping others. We experienced the energy of the heron at the end of our property bordering the golf course. This lovely bird would walk back and forth like a beautiful marcher. When I looked it up it was a matriarch sentinel. Both of our mother’s are now gone. Both of them would fit the description of being a sentinel over us, watching out with watchful eye. Also, this sentinel was persistent, beautiful, and consistently showed up during a stressful time when we could certainly use a sentinel. I remember it brought such peace to understand more about the energy of this bird. The symbol of the Power Totem is certainly experienced in this class. This particular class has all symbols of the Divine as part of the energy. It assists with the uplifting of energy, the connection with each participant’s Higher Self, and the interpretation happens on a spiritual level for each participant. Color experienced as light is one of the symbols and I was recently surprised to read what I had overlooked in my past readings. I was reading a new book by an author who has had many near-death experiences. This author sat on a panel in 1994 at the Congress of Enlightenment held in Houston, Texas, with Dr. Ed Martin. I have read all his books, but his last book stated that in one of his near death experiences he was told that colored light and flowers which change color would be part of healing stress. He was told that stress was over 90 per cent responsible for all illnesses. I had to laugh when I read this statement at Christmas. One of the gifts received from my sister is an angel holding flowers which change color in a miraculous manner. This angel sat on a gazing ball in this class beside a huge tube of flowing water which was colored water which changed color as the light filtered through the flowing water. It just looked pretty when chosen, but it was divinely chosen. Other symbols experienced are for initiating healing, personal empowerment, sending energy at distance, protection, and to assist with abundance. In one of these classes, over 100 robins showed up to be inside the labyrinth. Robins are signs of a new beginning. The week after one of these classes, a tree fell in a thunder storm. It would have smashed the end of the house which represented abundance in feng shui energy. However, a power wire caught the tall tree and held it. Dr. Martin took this picture because he felt the wire would break and insurance would need to see this story in picture form. The man who took the tree down after a complete week with the wire holding it agreed to do the work without the power being turned off. We had tried to get the power company to turn off the power to deal with this, but they had 57,000 people without power. The man did a great job and we decided to have a huge tree in Birmingham cut by him. I took the camera out to take a picture in Birmingham on the same roll of film Dr. Martin had used to take a picture of the tree in Kingwood, Texas. I used a one-hour Walgreens for the development to send to the man in Texas in order to get an estimate. We are sure it was a gift from the labyrinth energy. We were shocked to have this print returned of the tree in Kingwood. It showed colored orbs and energy holding the tree on the power wire. 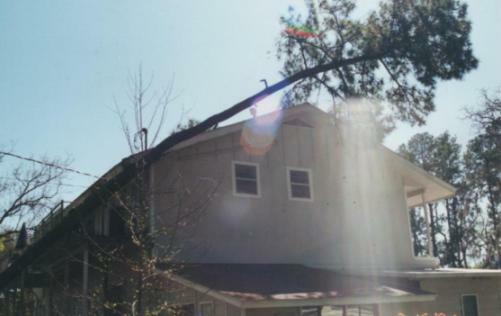 The power wire held that tree for a week with it never breaking to smash our house. As I worked on this part of the website yesterday, a person came in who said: “I don’t understand how symbols can be important. Explain to me about symbols.” As I stated earlier, symbols are Higher Self Spiritual energy. The left brain may not be able to adequately have a language to give credit to symbols. I struggled to appropriately use words which this obvious left-brainer could fathom. It has been proven the symbol representation of a person’s initials can literally add years or take years from their life. Here some examples: ACE, WOW, JOY, VIP, CEO, WIN, WIT, GEM as positives. Some of the downers were SAD, MAD, BAD, KKK, DIE, ZIT, PIG, DUM, RAT, SOB, SIK, HOR, BUM, etc. with all of these expressing negative energy. It showed the ones who have good symbols from their initials, by their studying death records, lived approximately 4.8 years longer than the ones with negatives initial symbology. This study was conducted in California and a large statistical group of death records were used. We started going through symbols from initials. It brought to mind the story of a person named Ann. Her husband wanted to put the name Ann in with their girls names. She would not do it because it would be: HAG for both of them. As we thought of people we know we only came up with one who had a slightly negative one that happened through marriage, SAP. Hopefully, she chooses now not to use her middle given name in her initial symbol but has switched to her maiden last name as the middle initial. The writers of the article stated that they believe the difference in length of life was from the stress of having to defend the negative initials from teasers, etc. I immediately thought of Dr. Emoto and the difference words had on water when reading this article. The miraculous part of it for me was the the article came out one day after having to defend the value of symbols! Also, the miraculous thing was that they called the initials, symbols.